Barrel Shield Bust-Up is the sixth level of Donkey Kong Country 3: Dixie Kong's Double Trouble! It is also the first level of the Kremwood Forest. In the game's Game Boy Advance remake, the level is instead the ninth level in the game, as well as the fourth area of the Kremwood Forest world, due to it switching locations with Springin' Spiders. 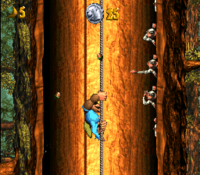 During this level, Dixie and Kiddy Kong climb to the top of two tall trees with many vertical ropes while dodging numerous groups of Minkeys that throw an unlimited supply of acorns at them; this is the only level in the original SNES version to have Minkeys. Fortunately, there are a few Barrel Shields around the stage that the Kongs can take advantage of to dodge the incoming acorns. Many Sneeks and few Buzzes can also be found here, along with a single Nid that provides access to the letter G.
The Kongs begin the level inside of a tree with an opening on the right of it that leads outside onto some branches that support a Sneek. A DK Barrel is placed next to the opening that leads into the second tree in the level, which contains a Buzz, who flies in front of a Banana Bunch, and a few platform that hold bananas. The Kongs can climb the platforms to reach a rope that they can travel up to reach some bananas and the letter K. As they climb higher on the rope, they come up to a couple of Minkeys that they must avoid. A Barrel Shield blocks the acorns from the second of the Minkeys. If they continue from here, they reach the end of the rope and an opening to the left that they can go through to exit the tree. Outside of the tree, they can find some branches that they can climb to reach some Sneeks and the way into a higher part of the first tree in the level. Here, they can find a vertical rope that they can climb up to reach a trio of Minkeys and the letter O, which is surrounded by bananas. As they pass the three Minkeys, a stationary Barrel Shield can protect them. Once they pass the letter O, they reach a group of four Minkeys that throw their acorns after one another, instead of at the same time. After they are passed, the primates reach some more Minkeys that throw acorns all at the same time in a straight path. They can use a pair of Barrel Shields to dodge their projectiles. The top of the rope is located after these enemies, and the Kongs can find some platforms here that they must climb to reach an opening that leads out of the tree and onto some branches with a pair of Buzzes orbiting a Banana Bunch above them. The Kongs dodge the attacks of several Minkeys. The way into the second tree is to the right of here. In the tree's interior, they can find a hole in the ground that they can fall through to reach a hidden Bear Coin and an invisible Auto Fire Barrel, which can blast them back up through the hole. Above the hole, the apes can find a vertical rope that they must climb. Several Minkeys that throw nuts after one another impend in their progress as they climb. Once the Kongs reach the top of the rope, they can find some platforms that can be climbed to reach a TNT Barrel, which they can use to break open some of the left side of the tree. If they walk into the opening they make, they can find an area with a Bonus Barrel in it. 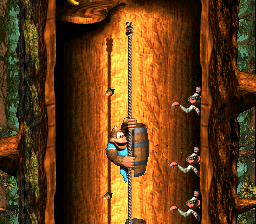 The Kongs must continue up a rope near the TNT Barrel to progress to five Minkeys that throw acorns after one another. Once the primates climb past these foes, they reach the top of the rope, where they can find a passage that leads out between the level's two trees. Here, there is a Sneek and some branches that can be climbed to reach the level's Star Barrel. At this point in the level, the Kongs can find a passage to the right of them that leads into the second tree. In this part of the tree, they can find a Sneek and some platforms that they must climb to reach a DK Barrel and a rope. As they climb the rope, they come past five Minkeys that throw acorns at them. They can dodge all of their nuts by hiding behind a moving Barrel Shield as they progress. Once they pass the foes, they reach some platforms that help them reach an opening that leads outside of the tree, where some branches can be found to help the Kongs reach the way back into the first tree. As they approach the opening to this tree, a pair of Sneeks get in their way. Once they access the tree, they can find a vertical rope with a group of Minkeys lined up to the left of it. They must use a moving Barrel Shield to climb past the foes unharmed. Another group of Minkeys is ahead, and they throw their acorns after one another. If they manage to pass these enemies, they discover another line of Minkeys on the side of the tree that all throw acorns at the same time. As a few time before, they must rely on a moving Barrel Shield to dodge all of the nuts. 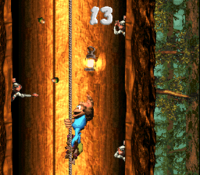 Soon after passing these Minkeys, the apes reach the top of the rope, where they can find the letter N and a passage leading outside of the tree, where some branches and a DK Barrel can be found. If the Kongs throw one another upwards, they can find some hidden branches, one of which that holds a TNT Barrel, which can bust open part of the tree to the left. The apes travel along some branches that lead to a Koin. If they walk through the created opening in this tree, they can find a steel keg and a Koin in a small area of the first tree. Another opening is to the right of the previously-mentioned DK Barrel that leads into the second tree encountered in the level. In this part of the tree, they can find a rope that they must climb to progress. Some Minkeys that throw nuts after one another impend in their progress as they begin to climb. Once this group of foes is passed, the Kongs can find several bananas and a trio of platforms, one of which that holds Nid, who can lift the primates up to the letter G and some bananas. A passage leading outside of the tree and onto some branches is to the left of here, and the branches lead the Kongs to another passage that they can travel through to reach the interior of the first tree. Here, they can find a vertical rope that they must climb to reach some Minkeys that throw acorns at them. They all throw the nuts at the same time, so the only way to dodge all of their nuts is by using a Barrel Shield that slides up and down the rope. There are five more Minkeys ahead of here, who throw their nuts in the same way as the previous Minkeys. As before, a moving Barrel Shield must be used to dodge all of their nuts. More Minkeys follow these enemies, and, similar to the two previous Minkey groups, they all throw their acorns at the same time. Therefore, a Barrel Shield that moves along the rope must be used to dodge their weapons. Once the apes pass these enemies, they reach the end of the rope, which is located next to a TNT Barrel. They can use this barrel to break a hole in the wall to the left, which they can then travel through to reach some branches at the edge of the area. After they climb the branches, they can find another passage that leads into the first tree. Here, they can discover a high platform and a DK Barrel, along with a hole in the wall that Dixie can hover through to reach holes in the following tree. If she hovers through all of the holes, she can reach a hidden Bonus Barrel. 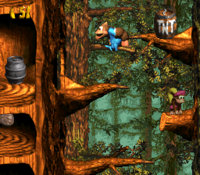 To the right of the aforementioned TNT Barrel, the primates can find another way out of the first tree; once they move through it, they can find some branches that lead them towards the opening to the top of the second tree. In this part of the tree, they can find the Level Flag. If they raise the flag, they complete the level successfully. K: The Kongs come up to the letter K as they climb the first rope in the level. O: After passing the first group of Minkeys on the second rope in the level, the primates reach the letter O.
N: The letter N is located above the vertical rope that is located just before the second DK Barrel from the Star Barrel. G: Once the Kongs climb the vertical rope located shortly after the second DK Barrel, they can find a Nid, who can bounce them up to the letter G and some bananas. Shortly before the Star Barrel, the primates can find a TNT barrel that can be thrown against a wall to the left to give access to an area that contains a Bonus Barrel. The barrel leads to a Bonus Level, where the Kongs must climb a rope in a tree and avoid six Minkeys without any shields. Once they reach the top of the rope, they can find the way outside of the tree. If they drop to the bottom of this area, they can find a Bonus Coin. They have 15 seconds to complete this Bonus Level. After the letter G, the Kongs should climb the neighboring tree to find a TNT Barrel. It must be used to blast away the wall on the left. Once this is done, they gain access to the outside of the tree, where they need to climb upwards with branches to another passage that leads into the tree again, where a DK Barrel is located. A hole is on the other side of the tree's interior, which Dixie Kong should Helicopter Spin through to exit the tree. Soon, she hovers towards the next tree and then enters it through an additional hole, while is followed by another on the other side of the tree's interior. A Bonus Barrel is on the other side of the hole, and if she enters it, she and Kiddy are sent into a Bonus Level, where they must collect 15 green bananas (or 10 green bananas in the game's remake) on a vertical tightrope while dodging three Minkeys. If they are hit by the foes' acorns, they are forced out of the bonus. Once enough bananas are collected, a Bonus Coin appears at the bottom of the area. The Kongs have 30 seconds to complete this Bonus Level. Immediately after passing the letter N, the Kongs must exit the tree to access the area between the level's two trees. Here, Kiddy must throw Dixie upwards to a hidden area with branches that hold a TNT Barrel. They must use the barrel to break open a part of the three to the left. If they head through the new opening, they can find a section in the first tree that contains a steel keg and a Koin, who is in possession of the level's DK Coin. They must throw the steel barrel at the wall to the left while standing above the Koin in order to make it bounce down onto the lower platform with the Kremling on it. As the Koin aims its shield at the Kongs above it, the barrel hits it, causing it to drop the DK Coin and fall. Shortly after passing the letter O, the Kongs can find a hole in the ground that they must drop into to find an Auto Fire Barrel that blasts them upwards. If they shift to the left of this barrel, they land in a hidden Warp Barrel that sends them to the Level Flag when entered. The Kongs shoot out of an Auto Fire Barrel. Kiddy and Dixie sit inside of a tree. Kiddy Kong climbs a rope in the Game Boy Advance version. The Kongs make their way towards the exit of one of the trees. There is a glitch possible in the Game Boy Advance version of this level. When Dixie tosses Kiddy into the Koin, Kiddy will bounce off and be ride-able. This normally should not be possible. As a result, when Kiddy gets off of Dixie, she will always appear to be bending down. This can be fixed by pressing "Select" to switch the player Kong. This page was last edited on April 10, 2019, at 13:22.